Your quad-copter is hovering nicely 100 feet north of you, its camera pointed exactly on target. The hover is doing so well all the RC transmitter controls are in the neutral position. The wind picks up a bit and now the ‘copter is 110 feet north. You adjust its position with your control stick but as you do the wind dies and you overshoot the correction. Another gust pushed it away from target in more than one direction as frustration passes your lips: ARGGGHH!! You promise yourself to get a new flight computer with position hold capability. How do multicopters with smart controllers hold their position? They use a technique called Proportional – Integral – Derivative (PID) control. It’s a concept found in control systems of just about everything imaginable. To use PID your copter needs sensors that measure the current position and movement. [Aerotenna] recently announced the first successful flight of an unmanned air vehicle (UAV) powered by a Xilinx Zynq processor running ArduPilot. The Zynq is a dual ARM processor with an onboard FPGA that can offload the processor or provide custom I/O devices. They plan to release their code to their OcPoC (Octagonal Pilot on a Chip) project, an open source initiative that partners with Dronecode, an open source UAV platform. Is it a quadcopter? A plane? No, it’s both! [Daniel Lubrich] is at it again with a vertical take off and landing transformer he calls the SkyProwler. The SkyProwler uses a switch blade type mechanism to move from quadcopter mode to plane mode. The wings can be detached to make it a normal quad that has all the typical bells and whistles. It can follow you around with GPS, fly autonomously via way points, and has this cool gimbal mechanism that keeps the GoPro stable as the drone pitches in flight, allowing for a better video experience. [Dan’s] ultimate goal is a full size passenger model called the SkyCruiser, which uses the same switchblade transformation mechanism as his much smaller SkyProwler. Be sure to check out the video below if you haven’t already, and let us know of any quadcopter / plane hybrids of your own. Correction: We previously associated [Daniel Lubrich] with the ATMOS program. This was in error and has been removed from the article. 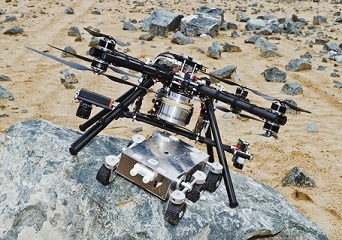 The ATMOS UAV is a separate project which we previously covered.